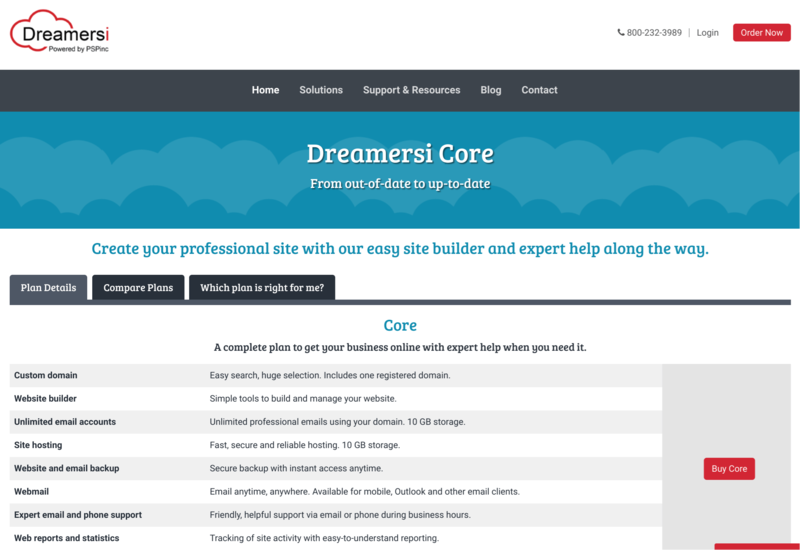 Dreamersi Review 2019: Is Dreamersi a Good Hosting? Dreamersi is the web hosting and development division of PSPinc. Its single customizable hosting plan comes at a high price. Dreamersi is the website hosting division of Pacific Software Publishing, Inc. (PSPinc) that provides shared web, VPS, and email hosting as well as web design services and domain registration. The web hosting comes as a single customizable ‘core’ package with add-on services. Dreamersi is located in Bellevue, Washington, and its website is in English and Japanese. A do-it-yourself website builder is also included, which allows you to choose from an array of professionally-designed responsive and SEO-friendly themes that can be customized. Content management can be handled via the wizard tool or by using HTML, CSS, and plugin tools. Dreamersi’s Email Only hosting plan includes 5 GB of storage for an unlimited number of email addresses. As per its name, this plan does not include any kind of website hosting, but it does include a free domain. Another division of parent company PSPinc is the ‘Newsmail’ email marketing division. Its email marketing system allows you to create and track email newsletters using responsive templates, scheduled emails, and unlimited lists. It’s a separate subscription that can be purchased through the Newsmail website. Dreamersi’s hosting doesn’t come cheap. The single customizable hosting package in its most basic form costs around three to four times as much as the majority of top American and international hosting companies. At this price, you might expect to see SSD and cloud technology, but you don’t. This hosting is more geared toward those looking for a full online services package. Aside from the higher-than-average price for web hosting, the add-on services also come at higher-than-average prices. It can be astronomically expensive to add storage, and it’s expensive to transfer an existing website when many hosts will do this for free. The single SSL certificate option is a pricey one. Customers pay a lot for the privilege of allowing Dreamersi to set up a website or blog for them. For example, a five-page template-based website with one hour of maintenance per month will cost thousands of dollars per year. Web hosting can be paid for monthly or yearly, and – on the plus side – you get two free months worth of hosting with an annual plan. Dreamersi is the web hosting and development division of PSPinc. Its web hosting and design options are priced well above most other web hosts we’ve seen. As such, this provider may be most suitable for small non-tech-savvy businesses looking for a helping hand with everything online. Get customizable hosting at a price with Dreamersi! Wondering how Dreamersi stacks up against other Web Hosting companies? Enter any other Web Hosting company and we will give you a side-by-side comparison.